If you hadn’t figured it out from my review of the InkWorks Projector pen, I really liked Star Wars: the Force Awakens – especially the adorable, new BB-8 droid. And, shortly after writing that review, I stumbled across another BB-8 themed pen, one with a large, molded-plastic clicker to go along with its orange and white paint job. I just couldn’t resist. This BB-8 pen, however, is produced by TGL, a company that seems to make a lot of similar pens for Disney. Unfortunately, they only seem to be available in Asian and European markets, so it took some hunting around online to find one I could purchase in the U.S. Eventually, eBay came through, and $10 and 30-days later, my BB-8 pen arrived on my doormat directly from Malaysia. The pen, flat-out, looks great. It’s surprisingly detailed, with BB-8’s antennae and eyes protruding from his head. But it’s also immediately clear that this pen is not very functional for anyone with adult-sized hands. The barrel is just too thick, it doesn’t fit in a pocket, and, it probably goes without saying, I feel rather ridiculous using this pen in public. And poor BB-8’s head constantly bangs into my hand whenever I write with it. Obviously, it’s a novelty pen, most of which look nice but function poorly. 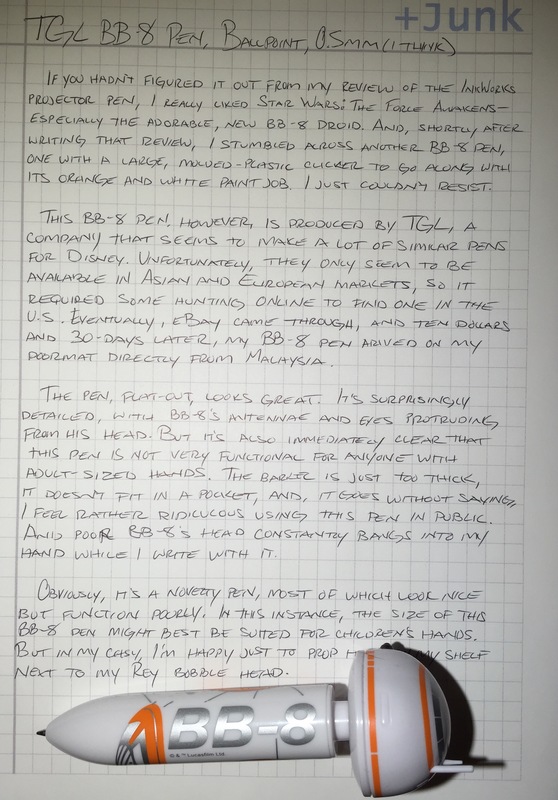 In this instance, the size of this BB-8 pen might be best suited for children’s hand. But in my case, I’m happy just to prop it up on my shelf next to my Rey bobble-head.